fences falling apart, trash, furniture on curb dogs running loose. Mosquitos are back. Breeding usually is either the reclaimed water facility at cross bayou, or the lake a few blocks south of us, or a pool in the neighborhood that isn’t taken care of properly. Thanks for any help you can provide!! Down here on Gibralter Court as well! Cardiff court is really bad too. Do we all need to submit a request or can you spray Westchester Estates and beyond? Snell Isle Blvd Bypass traffic is crazy! Traffic redirects away Snell Isle Blvd onto Mateo Way NE, Ricardo Way NE and Monterey Blvd. Turning a once quiet neighborhood into a thoroughfare. Can anything be done? Update from the SPPD: our District Community Service Officers have been out in the Snell Island area at various locations during times of highest traffic volume. This morning we were out at St. Rafael’s school monitoring bridge traffic, and we are also initiating traffic stops to ensure motorists were properly educated. Another Officer has been at Bayou Grande Blvd Ne and working closely with Shore Acres Elementary. We are also acting on input from residents as to where they feel we are needed. Those spots include but are not limited to Chancellor St Ne & Overlook as well as the Snell Isle Bridge. We are also working on placement of the speed trailer ASAP so that motorists will be more aware of their speed and to follow posted traffic signs. Thank you for your post. St. Rafael's school, Bayou Grande Blvd NE, Shore Acres Elementary, Chancellor St. NE have absolutely nothing to do with the area of my concern. And if you put a police officer monitoring the Snell Isle Bridge, or a speed trailer there, it encourages even MORE speeding by-pass traffic in the once quiet streets in my description. There is not even a sidewalk on Mateo Way NE and Ricardo Way NE to dodge the rush hour traffic speeding by. I cringe when I see children riding right into the blind spots knowing speeding traffic could be heading their way! I still worry there is going to be a pedestrian or bicycle accident as the by-pass traffic volume/speeding is out of control. I will call the police, but keep in mind, I am trying to point out a systemic issue. Not an issue where by-pass speeding traffic gets trained to look out for a police car. Then, if they see none, hit the accelerator because they are in a rush. It sounds like a straight away on a race track at times. A police car only solve the issue as long as there is a police car there all the time. Obviously, that can't happen. These side streets, in quiet neighborhoods were not meant to be, and never will be, major thoroughfares for speeding traffic. 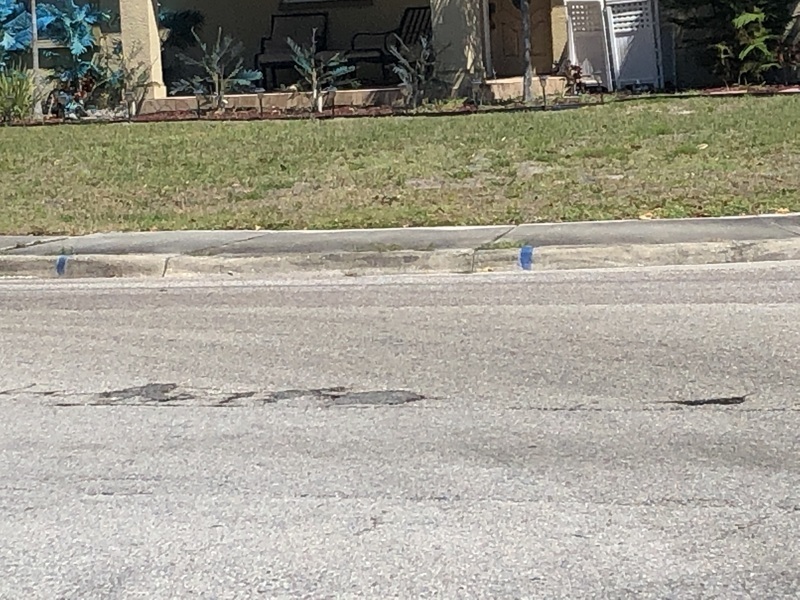 Drivers frustrated on Snell Isle Blvd, leaving the island, can't just decide to by-pass Snell Isle Blvd and very aggressive speed down side streets. This is an accident waiting to happen. 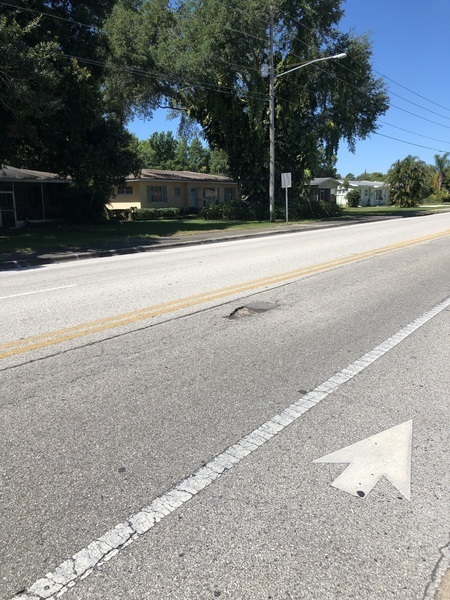 cluster of potholes located in intersection closest to 552 40th ave ne. Constantly parking all over front yard and sidewalks. Absolutely no respect for law or consideration of home owning neighbors. Your mesdage is obviously not getting through! Mulch does not equal driveway. We have a neighbor in an electric cart. Cant use sidewalk!! 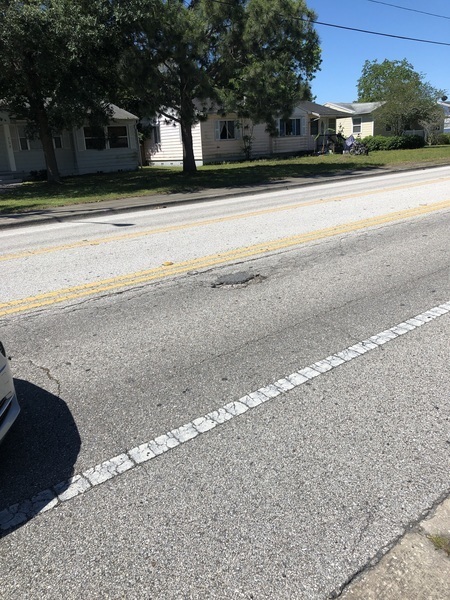 large pothole in crosswalk area. Collects water during rain also. Issue 5736021 has been marked as a duplicate of this issue. 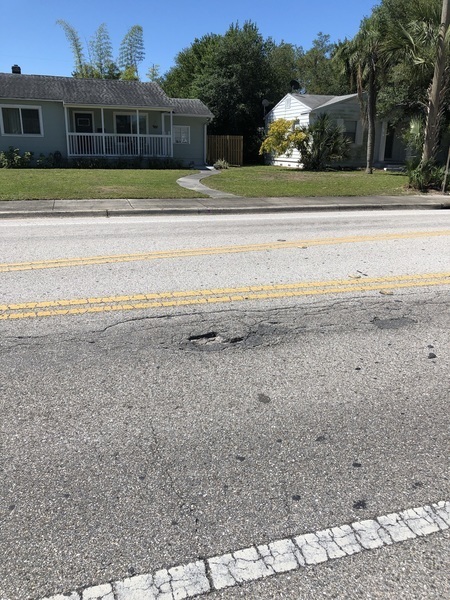 Does anyone know the details for the debris removal for the city of Seminole?